Wouldn’t it be great to have a boat you can use once in a while without the hassles of a full time commitment? It’s easy – share a boat. With Boat Syndication all you have to do is climb on board and relax. Pacific Boating’s fleet of Sea Rays is just one example of how convenient, economical and fun boating syndication can be. In between boats? A new boater looking for a hands-on lesson? Don’t want the hassle or cost of a full time boat commitment? Boat Share might be for you. There are several options for those who don’t want the costs or time commitment of owning and maintaining their own vessel. Aside from chartering a boat for occasional outings, you can enjoy a regular boating fix by joining a boat share or syndicated boating association. It’s that easy. While informal syndicates have been around for a while among boaties seeking to share costs, it is the legitimate boat-share companies with well thought out business plans that have really helped the idea of boat-share to catch on. Most, but not all operators offer equity in a boat. The best operators also offer transparent contracts with no hidden costs such as added fees for maintenance and mooring, or unforeseen expenses. Check that clear conflict resolution mechanisms are built into your contract. You generally have to pay for your own fuel, and some organisations charge an added levy for racing (more common for yachts) because of the increased risk of damage to the boat. There are subtle differences between these organisations, with those offering you a share in an asset usually requiring more responsibilities and associated costs than those that simply offer membership with an operation that owns, manages and operates its own fleet of boats. Both provide a more convenient and economical option to boat ownership for many people. You can enjoy the boating experience for a small percentage of the cost, and forget about the hassle of cleaning, berthing, insurance and maintenance. For busy professionals or people with young families, it’s a very appealing idea. Of course, you should carefully consider all the legal and financial obligations before putting ink to a binding boat-share or membership contract. This is particularly true if you plan to join a private syndicate. Even if you know the future co-owners well, make sure you have a contract, as a gentleman’s agreement and a handshake can easily turn into fisticuffs if things go wrong..
Other things to consider are factors such as where the boat will be moored and if your contract gives you reciprocal rights on other boats or fleets. One last point to think about is what you might owe or be liable for if the syndicate meets an untimely end. Fractional boat-ownership syndications give you an asset, which you can sell, but also create responsibility. Some say that the sense of satisfaction owners get from part-owning a vessel results in better maintained boats. Associations such as Riviera Syndication offer an ownership program in a range of Riviera Boats, both Flybridge and Sport Yachts, in a variety of popular locations around Australia (such as the Gold Coast, Brisbane, Sydney Harbour, Perth and Hamilton Island). Each boat has a maximum of 10 shareholders, each with a 10 percent share. This entitles them to 33 days of boating a year, plus stand-by days via an online booking system. Time is shared evenly between owners so that each owner has the same entitlements to weekends, public holidays, Easter and Christmas. Each boat is held for a maximum of three years before being sold. Owners will receive a 10 percent share of the resale revenue minus sales costs. “We get a lot of support from Riviera, and shareholders get to join the Riviera community,” says Riviera Syndication owner John Russell. “Our shareholders tend to be successful people who want to go boating but don’t have the time or inclination to clean and maintain a boat. It’s also a great way to get into boating, and we offer a three-day training program. Owners can also hire a skipper,” he said. Riviera Syndication is looking to sell up to 20 franchises around Australia. Pacific Boating offers a different approach. Pacific Boating’s proprietor Phillip Pitt describes the service he offers as similar to membership with an exclusive golf club. 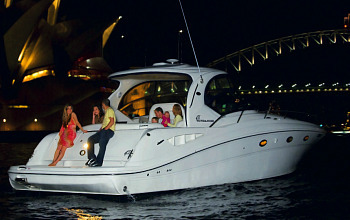 The Sydney company owns, manages and operates a fleet of luxury Sea Ray sports cruisers (from 32-44ft). Members can access and enjoy the boats with a walk on, walk off service. All members have to do is book the days or nights they want to use a particular boat and turn up. Their boat will be waiting, clean, refuelled and even pointing in the right direction! Tighter economic times or a busy lifestyle might mean your boating dreams seem out of reach, but it needn’t be the case. This innovative approach to boat ownership won’t suit everyone, but for some it will be the ideal solution. Boat share is attracting more and more people who, even if they can afford a boat, don’t have time to use it every week. It’s never been easier to enjoy the good life on a fully managed and maintained boat. “They are generally conservative in their decisions,” managing director Rod Cunningham says of Cruising Club Australia’s members. “They like value for money and are mostly families or family oriented. They are forthright and honest and enjoy a social occasion and having a good time. Most have had some boating experience but about 40 percent (and growing) are new to boating. “Although we are the ‘Cruising Club’ and conduct many ‘club’ functions, Equity Owners can participate in these occasions or not even know their co-owners—it is their choice,” he said. Seawind Catamarans’ Brent Vaughan said, “Our Whitsunday based syndicate owners commonly share an interest for the cruising and island hopping lifestyle but are time poor and struggle to justify investing in an entire Seawind. They join a syndicate until they have the time. “Though we have many sailors that join our syndicates with various levels of experience, we provide training to ensure all syndicate owners are well briefed and comfortable handling the boat before operation,” he said. “Our Syndicates are often smaller groups. They are easier to manage and often become quite social,” says YachtShare’s CEO Barry Pares. “YachtShare’s ownership program appeals to those who appreciate how much time and effort is involved in owning a large vessel outright—individuals and couples who are, in the main, time poor and need to maximise their leisure time and family time and enjoy sailing. “Currently owners include doctors, lawyers, self-employed couples and retirees who love boats but don’t want the hassle!” he said. “Our arrangement is unique in that it allows the shareholders to make money back from their investment,” said Patrick McManus of Casual Cruises. “You can profit from your boat share. It can be a good business opportunity without buying and running a charter boat. It’s cost effective corporate chartering,” he said. NB: NSW Maritime are currently putting together a discussion paper on boat share arrangements. To find out more visit www.maritime.nsw.gov.au. Like this review? Why not share it!